Medicinal uses: Remedy against gingivitis and mucosal inflammation of the mouth and throat. Also used as a digestive medicine to treat upset stomachs, flatulence and diarrhea. Also treats night sweats and excessive perspiration. Used as an anti-diabetic and as a culinary herb. Additional uses: This plant is well known for its culinary uses. 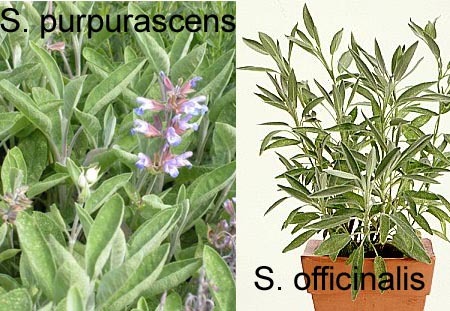 Traditionally this plant has been used as an ingredient in perfumes, soaps, and cosmetics. It is also used as an insect repellent. The plant attracts bees and makes a splendid honey. The dried leaves can be used in flower and herb arrangements. Sage tops yield a yellow-buff color to wool mordanted with alum, yellow with a chrome mordant and a green-gray color with an iron mordant (Kowalchik 441-2). Cautions: Do not take essential oil internally. Best if avoided by nursing mothers as it can dry up the milk supply.